The resulting charge and grappling of the owlbears was not what Syndus has meant by delaying the creatures. The situation was actually bad as Tibbs was one of the ones grappled. The small sorcerer wasnt as hardy as the rest of the group and bigger held by the bigger creature would not be pleasant. Hopefully, Ootah would break out her grapple and deal some payback. "Thanks Ky'rie!" The magus shouted as the elf slipped past them in retreat. The tiefling drew his scimitar and spent some of his arcane pool to enchant the weapon. He then yelled a battecry and stabbed at the giant owl creature grappling Tibbs. One of the monstrous creatures rushed at Ootah with surprising speed and knocked the air out of her, enveloping her into its bone-crushing embrace. Truly angry now, she attempted to push its arms aside in response. To her shock, she realised that the creature's grip was stronger than she had anticipated, and breaking out was going to be tougher than expected. At least this way it ain't going for someone else, she thought, struggling to break free. Pain surged through Tibbs tiny body as the foul smelling beast jerked him into a feathery bear hug. Garçon lunged for the great beast in defense of his master but could not pierce the feathery hide. In desperation, Tibbs closed his eyes and focused on the words of a spell, but the powerful embrace of the monster was too much to bear and the rat mage could not keep the arcane words in his mind. The sound of combat swirling around her, Char shows some alarm as two of her friends are scooped up by the angry hybrid creatures. Looking back and forth, she makes a fast assessment of the situation and settles her gaze upon Tibbs, who seems most in immediate danger. In a display of discipline and moxy, the witch casts a healing magic within easy reach of the beast, and touches Tibbs before he can be yanked away, letting the healing magic was through him. Standard Action: Defensive Cast CLW on Tibbs, using Remove Sickness. DC is 17, successful, but only heals 5. Step to J6 if possible. Neither creature was dissuaded from their prey, trying to remove strips of flesh from their meal gripped within their arms. 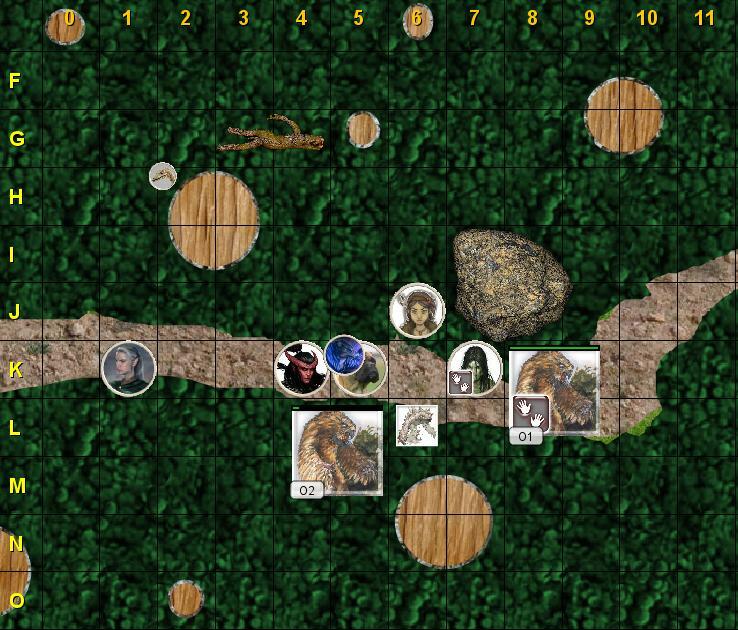 The annoying other prey around them were a distraction and they sqawked in roaring defiance, perhaps trying to scare away the competition for their meal of half-orc and ratfolk. The summoned earth elemental attacks again! Using the advantage by the flanking Syndus, the elemental slams into the owlbear. Ky'rie shouts out, "Tibbs, hang on, try and get out now!" A spat of elven magic later, and Tibb's feels emboldened to try and break free again. The elf grabs his crossbow from his side. Elemental attacks and hits for 10 damage. Suddenly Tibbs felt very slippery... but he wasn't quite slippery enough to escape the foul smelling behemoth. Again Tibbs tries to focus on the words to a spell and once more the words escape him. The brittle rat was beginning to think he might never get free of this creature. With Tibbs and Ootah having the life choked out of them, Char tries to cast another healing spell. However, flailing wings and looming threat of worse from the two creatures cause her to studder, and the building magic dissipates. Her disappointment registering on her face, she steps away from the monsters and prepares to try agian. Standard Action: Defensive Cast CLW on Tibbs, using Remove Fear. DC is 17, unsuccessful. Syndus grunted as the giant owlbeat still had a tight hold on Tibbs. The small creature was definitly in pain, despite the healing Char was delivering. The tiefling had to do something fast! Drawing upon his arcane, the magus charges his weapon with his shocking grasp spell. He then thrusts out as he finishes the chant. 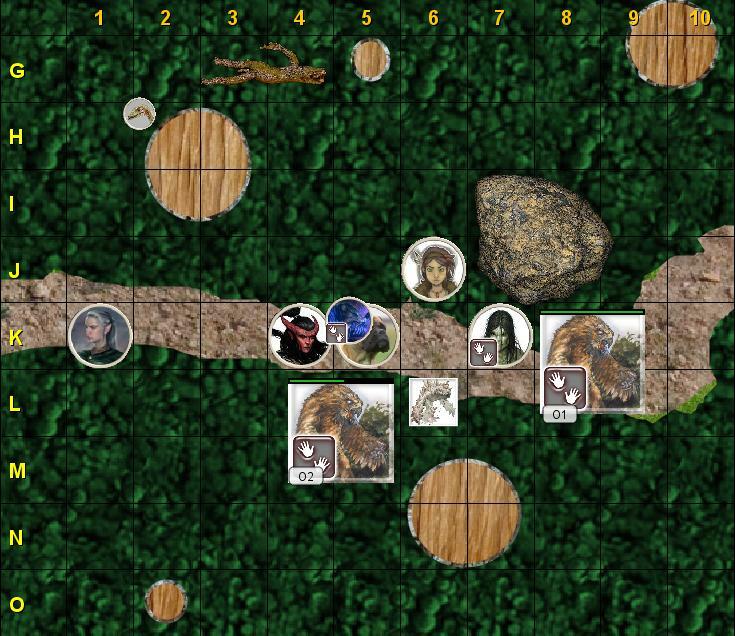 Unfortunetly, the owl bear dodged at the last minute, and the tip of the tiefling's scimitar caught nothing but air. 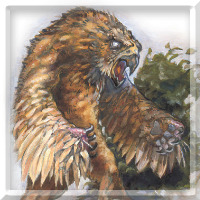 Roaring and squawking in pain, the owlbear holding Tibbs let go and became a whirlwind of claws and snapping beak. 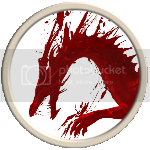 Syndus dodged a swiping claw and Tibbs ducked lower to evade the jaws of the large creature trying to remove his head. The owlbear swatted the earth elemental pretty hard, nearly shattering it into small gravel pieces. The magic holding it together kept it going though. 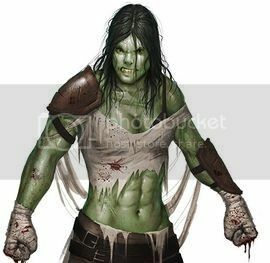 Meanwhile at the front of the group's line of march, Ootah still felt the bone crunching grip as the hulking monster would not let him go, nor could she free herself even a little. Continuing it’s furious assault, the earth elemental crashes it’s body into owlbear, the monster is able to ignore the slam and brush the elemental aside. Ky'rie's mercurial mind racing anew, he quickly analyzes the situation. The elemental and Syndus can hopefully provide some cover for Tibbs, but Ootah's still in trouble! He has to decide between trying to finish off the wounded owlbear or attacking the one grappling the half-orc. "Hang in there Ootah!" Actually the elemental's attack is a miss because there's no flanking. Darn. Now seriously angry, Ootah bellowed in pain and frustration as the monster showed no sign of letting her go. She decided that she needed to distract the creature somehow so that the others might be able to help attack it. To that end, she raised her club and tried to bring it down onto the creature's strong arms, in an attempt to break the deadly embrace, but her aim was off and her strike did not have any measurable effect on the beast. With just too much squeezing and not enough healing, Char desperately continues to try to ease the pain caused by the beasts, this time reaching out and letting a spell flow to Ootah, mending her partially as she struggles against the feathered creature. "Got you!" she cries out as she makes the touch the completes the spell. Standard Action: Defensive Cast CLW on Ootah, using Mage Armor. Heals 6. I guess they don't have reach then? That seems to be the implication. Free at last from the huge stinking creature, Tibb's first thought is of Ootah and he coaxes his steed up just behind her. Rage boiling inside suddenly erupts through the rat's fingers and he violently spits the words of evocation that send his golden arrows racing toward the half-orc's tormentor.